Note: this post is part of a series on creating an online presence. 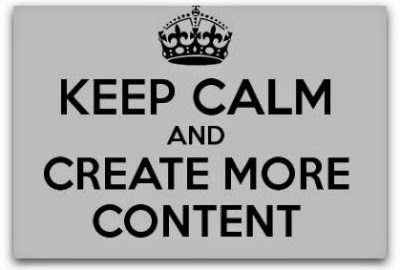 You may not think of your presence as content creation and some marketers might dismiss it as such, but it is content. If you are creating an online presence you are definitely creating content. The question is, what type of content will you create through your online presence? Now, let's discuss some simple examples. Your site can easily be a mixture of these (mine certainly is). Sure, you will update this content as needed, but only as necessary to keep the information accurate/current. The basic impact is that the more bells and whistles you need, the more technologically-demanding the solution will need to be. This does not mean you should avoid bells and whistles, it just means that you need to have a clear vision of what features you would like. Blog-like content can be a great thing especially if your goal is to regularly create content to share with others. Whether that is because you just like doing it or it's vital to your goals, blogs are good for frequent content. But if you just want to create a site with your headshot and some text, you certainly don't need to use a blog platform. But there is a solution for whatever you choose. You just need to know what you want to achieve. Taking the blog route carries something of an inherent commitment to create content regularly. If you announce to the world your brave new blog that will address the issues of the day, and then post to it once a year, you may do more harm than good to your goals and your personal brand. Your audience's expectations will be set by you, but, for the most part, I would suggest that if you plan to post less than once a week, on average, a blog-like site may not be a good choice. It is worth noting that sharing a blog can also be worthy considering, which brings us to the next question. Will You Need To Give Access To Collaborators? Collaboration can make a lot of sense for an online presence, especially if you are creating a blog on a specific field, industry, or hobby. Guest posters can help keep your content fresh and regular. This is another important feature to consider as some solutions have this naturally built in by default, but for others you might need to do significant work to achieve it. Do you want blog-like features? Do you need to have the ability to give access to collaborators? Do you want static pages, if so, about how many (and roughly what type of content will they have)? In the next post, we will start to look at some solution options.